Forgive me - but I am going to mention Christmas! I know it feels a long away - well, two months - but in original mosaic world, that is not long! I'm not going to make the same mistake I made last year, and not give people long enough to order - some were left disappointed, so I was too! So allow me to suggest a few ideas .. I am particularly useful for those people who have everything, or for those who are just simply difficult to buy for. or for yourself..! My small mosaic decorations - not suitable for trees, (unless you are having a Redwood this year!) - but suitable and fab for hanging anywhere else. They are becoming a firm seasonal favourite. These mosaic house numbers and names are really popular for gifts for others and, for yourself. I can make them in any colour combinations - they are thoroughly weatherproof, and thief proof as they have holes provided to screw to the wall! They are classy, vibrant and original. 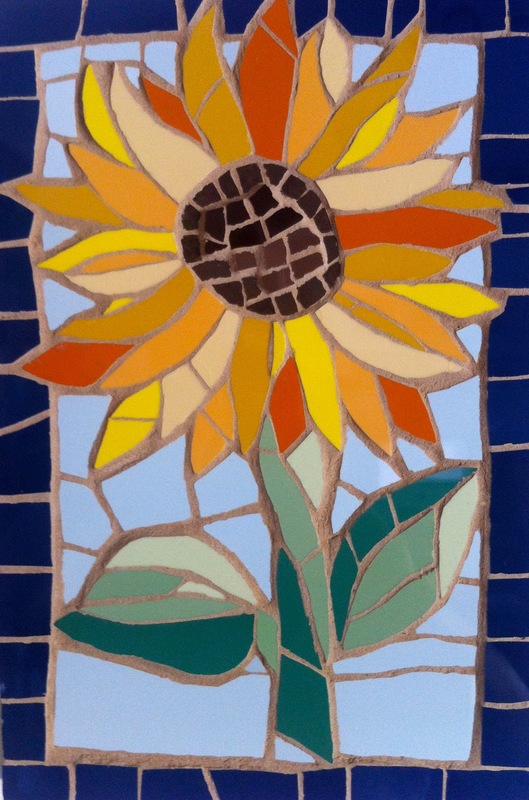 My mosaic sunflower makes a great present - especially in the depths of winter - sunshine all year round! I love making these beach hut mosaics - reminding of me great days, and holidays! I have to mention my mosaic furniture, which is just the best of both worlds - useful, and a bespoke work of art! I wont bombard you with all that I make - these can be seen on my lovely, newly updated website, and given enough warning, anything is possible! If my mosaics are something that you really want, why not get your friends and family to club together for your present this year? Thanks for reading my undisguised plugging of Christmas ideas from Just Mosaics! They really do make stunning, unique gifts. If you have an idea about something you would like me to make for you, that you cant see on my website, do give me a call and I'll see what I can do to help! The sparkling new Just Mosaics Facebook page! Having just got my head around Twitter for my mosaic art business, I read now that Facebook has got over one billion users! WOW! That's a lot of potential people who might like my work, isn't it?! I love the Facebook format of easy, daily updating, what's happening, new things I have made, offers, Christmas pieces at the moment and so on. It's like a daily newspaper for Just Mosaics! It is particularly good for my business as I am always creating new designs, and colour combos, as the commissions come in! Don't get me wrong - I still love my website, created by Judith Ogden (www.judithogden.co.uk) - it says all I want to about me and what I do,and is regularly updated - but the Facebook page is like having a chatty younger brother, full of new information about my business hot off the press - fab! The link is - www.facebook.com/justmosaics.co.- please take a look, like and share! People have left lovely messages and also given my mosaics the all important thumbs up (like! ), which shares my work with all their Facebook friends - amazing! What a great way to get my work out there, and create the buzz about it that I feel! I suppose that, like a lot of artists, selling my work is not one of my strengths - it all feels too personal, if that makes sense.. What I really love to do is be in my studio creating a stunning original mosaic for someone to enjoy for years to come! So, with all this social media around - which is not as scarey as I first thought! - and with the help of Judith and John - I am able to show so many more people what I do, and if they like, they can order - simples! It would be great if my Facebook page could be liked and shared within an inch of its life! - and that's where I need your help. Let me know what you think and I look forward to seeing you there! I first came across smalti in Venice on my honeymoon. Exploring the less busy streets, we found a dark shop of vats, filled with coloured glass from Murano - the neighbouring island, famous for its glass making. The depth and vibrancy of the colours were breathtaking - a heavenly pick and mix! - and I have been smitten ever since. With the proceeds from my first ever commission, I bought some authentic smalti, which are more rectangular pieces of this glass mosaic tile. When the parcel came, it really was exciting, and to open it, exhilarating! The colours! The nuggets of loveliness! And yes, I marked the moment with a photo! To put smalti in a historical perspective, they were originally used in mosaics created during the time of the Byzantine Empire - 330 -1415. They were made by mixing molten glass with metal oxides for colour; the result was a cloudy mixture that was poured into flat slabs and then cooled, and finally broken into individual pieces. The molten mixture could also be topped with gold leaf - very expensive! During the Byzantine era, Constantinople became the centre of the mosaic craft. These days they are made by pouring molten liquid poured and cooled in trays, resulting in the pieces, like the ones you can see in the photos. Working with smalti can be quite challenging. They do snip easily in straight lines, but are all different depths and heights, which makes it very interesting - like making your own jigsaw puzzle! In my work with smalti so far, I haven't used grout, so emphasising the vividness of the colour mix. It is a real treat and privilege to work with them, and I look forward to creating some big stunning pieces in the future.